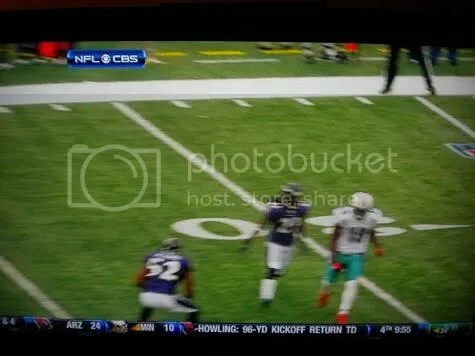 Ed Reed picked off his third pass in just two games in 2010 against Miami on Sunday, but he owes a debt of gratitude to Dolphins receiver Brandon Marshall for an assist on the interception. These photos show it a little more clearly. 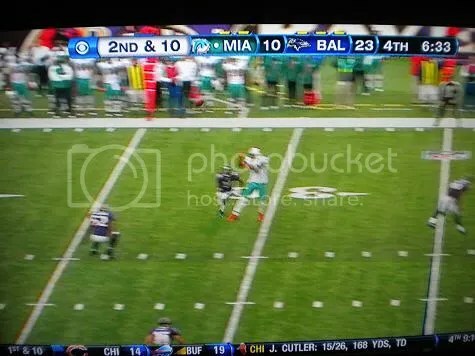 Here, you can see the Marshall has clearly beaten Lardarius Webb to the inside. Lewis is lurking in the lower right corner of the screen. Now, the “money shot,” as it were. 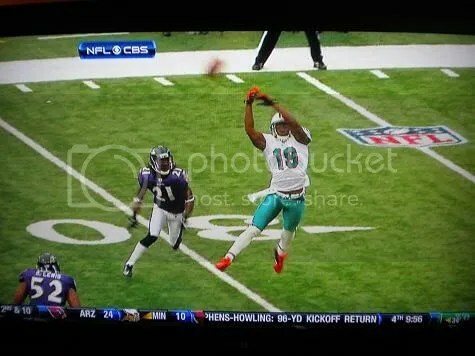 Does Brandon Marshall look like a guy who is concentrating on watching the football into his hands here? 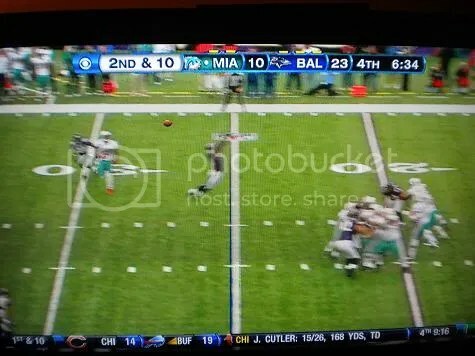 His head is down just as the ball bounces off his fingertips, and you can bet the farm that he is looking at/for Ray Ray. Ray was in prime position to put together another audition tape for the NFL’s next “how to legally destroy a ball carrier” video series. 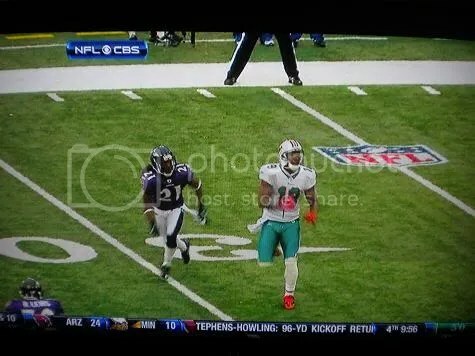 Instead, he turns to watch the ball go right to Ed Reed. Game, Set, Match…Ravens. On the CBS broadcast, Dan Dierdorf spent the next minute or so ripping into Marshall for the lackluster effort to catch what was, admittedly, an off-target Henne pass. Dierdorf, though, never pointed out the true reason for the alligator arms. This entry was posted on November 8, 2010 at 10:31 pm and is filed under Hating, Ravens. You can follow any responses to this entry through the RSS 2.0 feed. You can skip to the end and leave a response. Pinging is currently not allowed.